This fortified behemoth of a basilica was designed in the 16th century with a dual role: as a place of worship, but also to protect the citizens when pirates attacked the city of Almeria after the Reconquest. Built in 1524, after an earthquake destroyed the previous structure, the cathedral is constructed, like so many churches in Spain, on the site of a mosque. Largely late Gothic/Renaissance in style, the cathedral's defensive structure consists of largely plain walls (apart from the elaborate entrance, Puerta Principal) with small, high windows, all designed to be inviolable to the invasions by North African pirates, which continued for many years after the Moors were expelled from Spain. This is the country's only fortified cathedral dating from the 16th century. With three naves and three chapels, the magnificent Gothic interior is on a typically grand scale, with ribbed ceiling and soaring arches, featuring Baroque and neo-classical details. The Capilla de la Piedad has some superb paintings - the Anunciacion by Alonso Cano and Murillo's Concepcion Inmaculada, while dog-lovers will enjoy the Capilla de Santo Cristo where the Bishop Villalan, who founded the cathedral, lies in state in his marble tomb, complete with his hound at his feet. The choir stalls, carved from walnut, and the Sacristia Mayor with its fine stone roof, windows and arches, are particularly impressive. The stalls and bishop's tomb are both by Juan de Orea. The cathedral shows many typically defensive features such as ramparts and artillery loopholes - the four circular corner towers, which look like they belong more on a castle, once held cannons, which could hold off Moorish invaders (see also the bell at the Alcazaba). 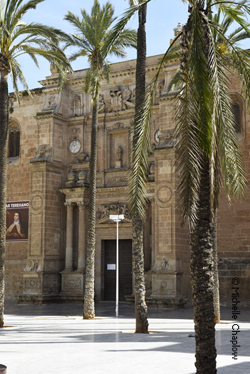 Look out for the carving of a sun on the eastern wall, the Sol de Portocarrero, not a symbol typically seen on religious buildings, which is now used as the logo for Almeria province. The Renaissance north facade is an elaborate mid-16th century design, also by de Orea. The broad pedestrianised plaza in front of the cathedral is very pleasant, with lofty palm trees and plenty of space to stroll, contemplate the basilica, and for children to run about. Admission: 5 euros (under 12s free) - includes audio guide.